i heart peonies: i heart... my dress! I got my dress!!! It is my "dream" dress- meaning that it is vintage (1950's-esque), ivory, fabric covered buttons and with a slight train- and its a Vera Wang. No pick-ups, no beading and very little of what everyone else seems to be doing. The fabric is soft and lush. I love it. No, I am not posting pictures. Jake wants to be surprised. I bought it at the Macy's State Street store. 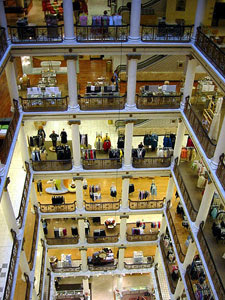 I have been boycotting Macy's since they took over Marshall Fields. I was very emotional about the sale of Field's. I love my city and I am proud of the things that originate here. I am very sensitive about New York people (like Donald Trump and his ugly skyscraper) and companies coming in and thinking they can do better. Chicago is cool on its own. I signed petitions, sent out emails and began my boycott. The rub is that when I was little and shopping with my Grandmother, I accidentally wandered into the bridal salon. I thought it was a magical, secret place and I knew I shouldn't have been there. That was always in the back of my head while shopping, regardless of how many classy bridal salons I walked into. I couldn't have Marshall Field's back and this was as close as I was going to get. I just took a deep breath and a long look at the Marshall Field's sign still hanging on the corner of Randolph and State before walking in. The service was great and I had a very nice experience, but I still gave money to the enemy. I found my dress at the new Vera Wang Salon on Oak Street. The shop is the Tiffany's of bridal salons- beautiful show room, impeccable customer service and it carries its own sense of fame and mystique. I was very nervous to visit because I didn't want to find anything. I purposefully, and successfully, avoided the Luxe (read: over 10k) section because I could only have fun there with a million dollar budget. I tried on my dress and felt comfortable, beautiful and happy in it. It was "me." My mom, sister and bridesmaid Christine agreed. I took a few mental notes and made another appointment. The day of said appointment, I decided to call Macy's for fun. They are the only other Vera Wang retailer in the area and I thought I would just verify that I wasn't going to pay too much for this dress. While Macy's did offer it for about $150 less, I was still going to go with the VW salon to avoid shopping at Macy's. Then the very sweet sales associate mentioned that Macy's had my dress as a sample- 50% off. It was the same size that the VW Salon was going to order for me. It was in excellent condition. Done and done. Hurray! I picked "her" up that day and brought her home. I had the biggest smile on my face, riding down the escalators at the State Street store and then through the streets of Chicago with a huge white garment bag. I wish I had a photo of it. The only downside to this is that she has to live in my old closet at my parent's house until I am ready for cleaning and alterations next June. Just try and keep me from taking her for a test drive at least once a month. Shop around. You don't have to break your budget for your dream dress. Most of the big designers have a sample sale once a year or you can try your local sample stores. And if I can have two morals- its okay to sell your morals for a dress, if its a Vera Wang on sample. No, really.